Rehabilitation technology that uses music to help neurological patients recover lost movement will reach a global audience at the International Society of Physical Rehabilitation Medicine’s congress in Paris. This is the first time a music-based therapy component has been merged with biomedical technology to help patients with Parkinson’s disease and stroke regain walking. At their debut appearance at the ISPRM World Congress in July, Biodex Medical Systems, Inc. will exhibit the new Gait Trainer 3, an advanced system that uses music and the principle of neuroplasticity to change lives for patients with movement disorders. This combination of music and technology is a first in neurologic rehabilitation. Decades of research point to the value of neurological music therapy techniques for treating sensorimotor functions. The Gait Trainer 3 hosts a library of informed music, tempo-to-cadence matched selections written and composed by music therapists to inspire correct movement in individuals who have lost function due to brain injury or disease. 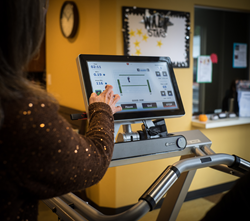 The instrumented deck of the Gait Trainer 3 facilitates walking exercise with visual biofeedback, and provides objective reporting to demonstrate progress. See the Biodex Gait Trainer 3 at ISPRM World Congress in Paris July 9-12, booth #53. Or, visit http://www.biodex.com/gait. Biodex Medical Systems, Inc. uses science and technology to drive treatment innovation across physical medicine, nuclear medicine and medical imaging categories. With a history of manufacturing and engineering excellence that spans more than 60 years, the Biodex mission is to provide innovative solutions and customer-driven support to medical facilities and wellness centers around the globe.